Shopify has a feature to export and import the product list via a CSV file, however, imported products would become not-synced with Oberlo. Therefore, after you import products to Shopify, you will have to sync them with Oberlo using the "Override" feature. To export your products, go to your Shopify admin > Products page and click on "Export" button at the top of the screen. Select preferred options and click on the "Export products" button. In several minutes a product list will be downloaded to your computer. 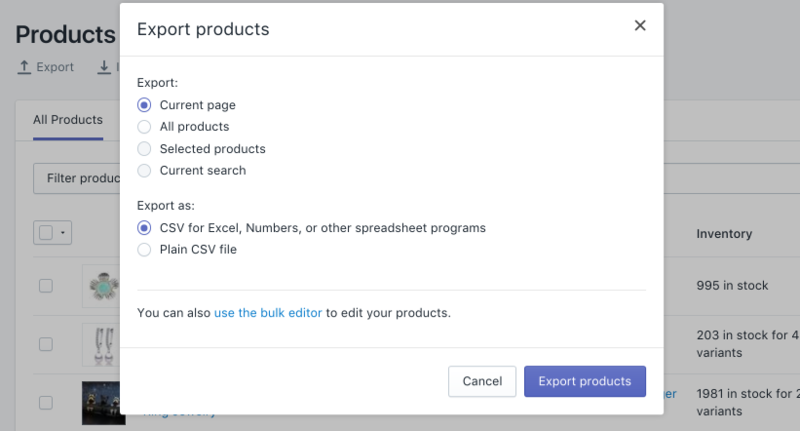 To import products via a CSV file, simply click the "Import" button. From the pop-up menu, choose a product list file from your computer and click on "Upload file". It takes a little bit of time for Shopify to import all your products. Once complete, do not forget to override your products to resync them with Oberlo.